Introduction EMSL Analytical, Inc. is hosting a comprehensive day-long course that takes place in Miami on May 3rd. EMSL Analytical, Inc. is hosting a free Assessing the Built Environment for Water Damage & Fungal Growth Workshop on Thursday, May 3rd in Miami, Florida. Registration will begin at 8:00 AM followed by training from 8:30 AM to 4:30 PM. Enviro Team North America’s Patrick O’Donnell, CIEC & Jason Popovic, CIE will cover information related to water intrusion, water vapor, and ASTM recommended fungal assessment report preparation. The training will be broken down into three sessions. Session 1: Water Intrusion, will begin with an introduction to the IICRC S 500 Reference Guide; shortly after, moving into Water Microbiology and health concerns with exposure to contaminants. This session will also include information on how water affects various building products and ASTM Standards. Session 2: Water Vapor, will discuss water vapor transmission, source identification & water vapor pathways, as well as ASHRAE, ASTM & US Army Corp of Engineers Standards. Session 3: ASTM recommended Fungal Assessment Report preparation, will provide attendees with information regarding, the organization of a report, mandatory information, methods, inspection results, observations & limitations, presentation, and summary and references. This complimentary workshop will be hosted at the Miami Airport Marriott located at 1201 NW Le Jeune Road, Building A, in Miami, FL. To register or learn more about this upcoming event, click here. For a PDF flyer of this workshop, please click here. For other training opportunities and laboratory services offered by EMSL, please visit http://emsl.com/Training.aspx, call (843)737-6955 or email jmazonas@EMSL.com. 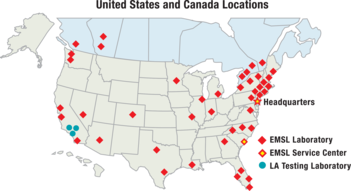 EMSL Analytical, Inc. is one of the leading testing laboratories with 43 locations throughout the United States and Canada. EMSL is a nationally recognized and locally focused provider specializing in fast laboratory results for mold, bacteria, Legionella, USP <797>, pathogens, asbestos, lead, soot, char & ash from fires, VOC’s, odors, radon, formaldehyde, indoor air quality, microbiology, environmental, industrial hygiene, radiological, food, beverage & consumer products and material testing services for the identification of unknown substances. EMSL services both professionals and the general public. EMSL maintains an extensive list of accreditations from leading organizations as well as state and federal regulating bodies including, but not limited to A2LA, AIHA LAP, LLC. (AIHA EMLAP, AIHA IHLAP, AIHA ELLAP), NVLAP, CDC ELITE, CPSC, CA ELAP, NY ELAP, TX DOH, NJDEP and multiple other state accrediting agencies. Please visit our website at www.EMSL.com for a complete listing of accreditations. In addition, EMSL carries a wide range of Sampling Equipment and Investigative Products for environmental professionals.